Fitted wardrobes can be used to define a space or give a new look in your home. A fitted wardrobe creates a one-of-a-kind style and character for a bedroom. These practical additions can also increase storage space in a functional and creative way. Fitted wardrobes help maximise limited space and give you exactly the storage space you need. They also look great and help create a seamless and uniform style in a room. There are a range of styles used for fitted wardrobes. Fitted wardrobes are customised for a space and can be free-standing as well as mounted or built into a wall. The type of fitted wardrobe selected will depend on how much space is available, what items require storage and the layout of the room. It will also be defined by personal preferences and design objectives for the space. A fitted wardrobe can also be designed to match existing furnishings in a room. A variety of materials can be used for a fitted wardrobe, including fabrics such canvas and polycotton. Wood, plastic and metal are also common materials used to create fitted wardrobes. When creating bespoke furniture, it is always a good idea to match the material and colour of the piece with design and style elements found elsewhere in the room. Most fitted wardrobes feature either sliding panels or doors. In addition to panels or doors, fitted wardrobes can also include drawers for storing smaller items. The number of doors and drawers will depend on individual storage needs, although wardrobes typically have two, three or four doors. Mirrored wardrobes are also popular since they create a sense of a larger room. 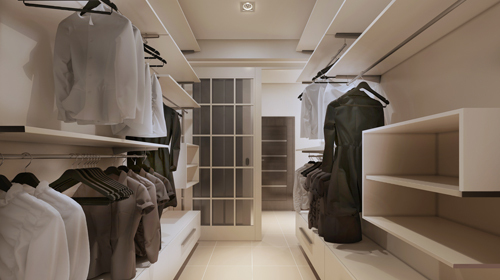 Fitted wardrobes can be fully customised for a space and reflect personal style preferences. They can also be part of a larger fitted bedroom project with a full range of other fitted bedroom furniture. Homeowners can work with planners at chains such as John Lewis, B&Q and IKEA to design a fitted wardrobe, or with designers at smaller independent firms. Alternatively, an interior designer can be hired to design a wardrobe. Many leading home improvement businesses offer planning and design advice for custom furniture, including fitted wardrobes. Visiting local branches provides an opportunity to see examples of a firm's work and get design ideas for your own fitted wardrobe. Smaller, independent companies also operate showrooms and have designers on hand for consultations. Reputable firms will give no-obligation estimates for your project and survey your space to verify measurements. They will also have qualified installers, including tradespeople who are registered with the government-backed Institute of Kitchen, Bedroom and Bathroom Installers. A deposit is typically required when hiring a builder or business. Builders and businesses that demand up-front or cash payments should be avoided. Alternatively, you can hire an interior designer to help design a fitted wardrobe. An interior designer can provide advice on your design ideas or create a fitted wardrobe that best suits your space. When choosing an interior designer, determine the type of service you need and have clearly defined objectives for your wardrobe. The best designers are members of the British Institute of Interior Design. Membership in the association gives you the peace of mind that you are working with a skilled, experienced and professional interior designer.